With a portable English-teaching income, Paul Maxfield will soon spend half his year in Jacó, Costa Rica. Six months. That’s how long until I am fully retired. And, although it isn’t official yet, my retirement lifestyle has already begun. 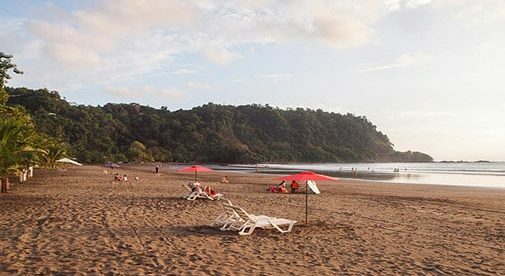 Several years ago, my wife and I decided to spend our retirement years in our second homeland, Costa Rica. We had lived there for 11 years while our children were growing up. So, we began to build a life there again. Now everything is in place, and we spend about seven to 10 weeks a year there. In September, that will increase to spending about 50% of our time in Jacó, our adopted beach community. There are the tranquil walks on the beach as the sun comes up. The fresh air, the musical waves, and the scarlet macaws that are always visible as the dawn gives way to the morning. Witnessing this part of the day is a ritual for us. We also include a stop at our favorite bakery for hot manita, a variation on the French baguette, Costa Rican style. Some mornings, instead of the walk, we do a bike ride through town, hitting all our favorite little barrios (neighborhoods), enjoying the sounds and sights of the local residents beginning their days, the roosters reminding everyone that it’s time to get going. Many mornings, we stop at our favorite soda (local restaurant) and purchase a supply of gallo pinto, the popular breakfast dish of rice, beans, onion, green pepper, cilantro, and other Costa Rican secrets, all lightly fried to perfection. Back at our condo, as I throw together a smoothie of pineapple, mango, banana, and papaya, I look out over the vibrantly blue ocean, and I am grateful. Each part of the rest of our days has its own delights. After breakfast, I tuck into my work. I teach English online to children in China through VIPKid. It’s a fantastic way to add some income to your retirement plan, and many people teach from all sorts of places overseas. All you need is to be an American or Canadian native-English speaker, have a good internet connection, and hold a bachelor’s degree. The kids are delightful, eager to learn, and your schedule is completely under your own control. I absolutely love it, and no matter where I go in the world (we travel a lot), I can teach for a few hours, and then get on to my sightseeing or routine. Then there’s the walk to the park midmorning to exchange greetings with the resident parakeets. Or there’s another bike ride around noon to the stand of trees just outside the local soccer field, where toucans tend to hang out. Before we spot them, we can hear them calling us, luring our gazes into the depths of the branches to find them. Around noon, we might enjoy lunch with some friends, and then a walk to the local supermarket to stock up on all our favorites, followed by the mid-afternoon swim, when the sun is at its hottest. The view of the ocean from the pool is stunning. And lastly, there’s the sunset on the beach, just a few steps from our door. When there is a particularly vibrant sunset of colors, local residents find their way to the beach, and a whole community stands, almost in complete silence, as the sun draws its magic in the sky. It’s mesmerizing. It’s calming. It’s inspiring. And I could say the same about the whole experience of living in Jacó. Whenever we are there, it becomes more and more evident that this place is in our DNA. It is home. And we are grateful to be able to spend so much time there.